Ånglok med tender klass 043 typ DB, längd över buffertar 112 mm, epok IV. Model: This model has been extensively reworked. All of the driving axles are powered. The locomotive has dark wheel flanges and valve gear. It also has new complete, working rods and valve gear. The brakes, rail clearance devices, inductive magnet, etc. are modelled. The locomotive has larger buffer plates. It also has a prototypical paint scheme and lettering. Length over the buffers approximately 112 mm / 4-3/8'. 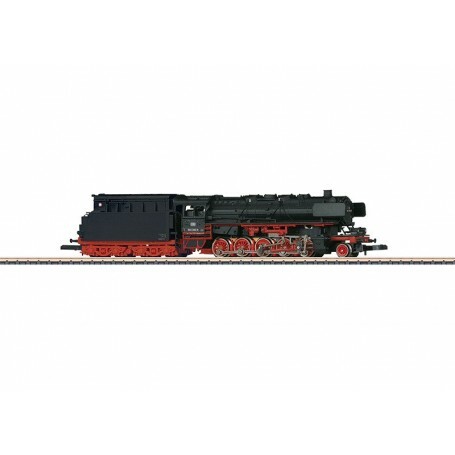 Prototype: German Federal Railroad (DB) class 043 heavy freight locomotive. Version with oil firing and Witte smoke deflectors. Used for heavy freight trains. The locomotive looks as it did around 1975, road number 043 364-9, Bw Rheine, BD Hannover, assigned to Rheine, Germany. 88974 Class 043 Steam LocomotiveA five-axle heavy locomotive with a tender was planned for heavy freight train service as early as 1923 in the type plan from the DRG's standardization office. The locomotive builders Borsig and Henschel in cooperation with the standardization office worked out designs for heavy 2-10-0 freight locomotives in twin cylinder versions as a three-cylinder locomotive and a four-cylinder compound locomotive. Ten each test locomotives in two and three-cylinder designs (classes 43 and 44) were then delivered in 1926/27 similar to the delivery of the express train locomotives. This was done to gain information about the design that was more suitable.Initially, the class 43 units proved more economical compared to the class 44 units. Their steam consumption was clearly less. For that reason after the first 10 pre-production locomotives of the three-cylinder variants, the 25 units of the twin cylinder variant of the class 43 were initially purchased. Yet things turned in favor of the three-cylinder locomotive: The high piston strength as a result of the large cylinder diameter of 720 mm / 28-3/8' led to damage to the running gear and frame on the class 43 units. The savings from the simpler design were consumed by the greater maintenance costs. Therefore, the three-cylinder class 44 locomotive then went into regular production starting in 1937. By 1944, 1,753 locomotives of this class were in service on the DRG.The class 44 units fulfilled the expectations set for them in heavy freight train service all over Germany. After World War II 1,242 units remained on the DB and the DR had over 335 units. Beyond that there were locomotives running in Poland, Czechoslovakia, Austria, France, Belgium, and even in Turkey. The class 44 was indispensable for years on the two German state railroads. They were therefore not only maintained continuously at a high state, but they were also partially rebuilt. In 1950, the DB equipped several units with combustion chambers and starting in 1955 thirty two units were fitted with oil firing that resulted in an increase of performance of around 190 pounds per square inch. Starting in 1968, the oil locomotives were designated as the class 043. The last class 043 units were in use near their base of Rheine by the end of steam motive power on the DB in October of 1977. They proved themselves among other things as multiple unit motive power pulling 4,000 metric ton ore trains. Numerous units remained preserved as museum and memorial locomotives. A car set to go with this locomotive is being offered under item number 82189. Prototypical rods and valve gear. Brakes, inductive magnet, and rail clearance devices modelled. All driving axles powered.